The Online MBA from Kingston University is designed to provide game-changing skills and insight that is immediately applicable in actual business scenarios. With an equally rigorous curriculum as the on-campus Kingston Business MBA, the Kingston Distance Learning MBA allows candidates to get a powerful degree from anywhere in the world while continuing their career. The Kingston DLMBA has full accreditation of the AMBA, ensuring its international recognition. An MBA is a clear way to move your career forward. With a part-time online MBA, candidates get the unique ability to pursue the international favorite of business education, while continuing their professional work. Program modules, schedules and course materials are all designed for flexibility, to meet the professional demands of each candidate. Beyond high-calibre faculty and cutting-edge online education platforms, Kingston Business School boasts a robust and thriving research culture. Primary areas of research include behavioral analysis, business modelling, creativity in business, consumer research, emerging technology, international collaboration and more. With advanced facilities and the latest developments in business research, Kingston Business School is able to effectively merge business with innovation. In exceptional cases, considerable work experience may be substituted for an undergraduate degree. Candidates under consideration will participate in a video interview with admissions officers. Alternatively, candidates may submit a 3-minute (max) personal statement video. 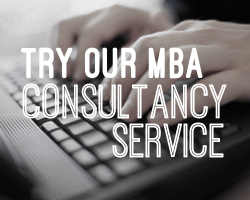 Master of Business Administration from Kingston Business School, Kingston University. The Kingston Distance Learning MBA is fully accredited by the AMBA (Association of MBAs). The Kingston Distance Learning MBA program is divided into two parts. Candidates will study a series of core modules during the first half of the program, followed by an elective curriculum during the second half. Candidates can choose to fulfill their elective requirements either via participating in designated courses or by completing an individual MBA project. The MBA project is a valuable opportunity for students to apply theoretical concepts and knowledge into a live business context. In addition to 2 elective courses (30 credits), MBA projects may be completed for 30 credits. Projects are designed based on the interests of each student and have previously included consultancy projects, the development of a business plan for their future business and academic research projects. NB: Students must achieve a 60% or above in at least 60 credits in order to qualify for the MBA project. Enrolling in an MBA program is a significant commitment for MBA candidates, both personally and financially. By enrolling in a part-time distance program, candidates are able to study while maintaining part or full-time work. Fill out your details to find out more about Kingston Distance Learning MBA.